Before the rise of smartphones, flip phones were all the rage. They were a compact way of combining a screen and keys, and few things were more satisfying or cool than flipping one open or closed. Touchscreens rendered them less necessary, but we can't help feeling a tinge of nostalgia towards them, so the discovery that Oppo is seemingly working on a flip smartphone prototype has got us excited. The phone, which was reported on by Zaeke.com and brought to our attention by Major Droid, looks absolutely massive. In fact, when opened out it looks more like a tablet than a phone, and there's no keypad here. Instead, both halves are screen. It's an interesting idea, as in theory it could be phone-sized (albeit a bit chunkier) when closed and double as a tablet when open. But this prototype definitely needs work - we can't imagine it would fit in many pockets, even when closed. Little is known about it beyond what can be gleaned from the picture. 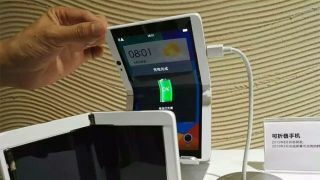 The phone runs Android, but there's no word on its specs and it's not entirely clear, for example, whether the screen bends or whether it uses two screens with a join in the middle. We wouldn't expect to be able to buy Oppo's flip phone any time soon, if ever, but we'd love to see flip phones makes a comeback, and a more polished version of this could be the phone/tablet combo we've been waiting for. Oppo might not be alone in its flip phone ambitions either, as a recent Motorola teaser video pays serious tribute to the Motorola Razr. If the flip phone revival is coming, we're ready to welcome it with open arms.